When it comes to running a simple business, it’s important that you’re able to reach whatever sales goals that you’ve set for it. This is not an easy task by all means, but you will need to do it if ever you want your business to reach the success that it deserves. Which is why it’s important that you’re able to come up with a plan that outlines all the details regarding how you and your business’s employees should go about in reaching these sales goals. The kind of plan template you want to make is called a sales plan and this article is going to teach you how to make one. As already mentioned, the entire purpose of a sales plan is to point out everything that needs to be done in order to reach whatever sales goals that have been set. Although there are some goals where there’s no set deadline, there are still some people who wish to achieve them sooner rather than later. While they all have their own reasons for doing so, those that do wish to meet their sales goals within a certain time frame must then be able to come up with an effective plan. The first step when it comes to making your sample sales plan is that you should definitely figure out what your goal is. Since we’re talking about a limited time of either 30, 60, or 90 days, you must be able to know what it is that you want your business to achieve within those time limits. The goals you decide to go with will depend entirely on which you choose and what you think is best for the business. The entire point of sharing these goals in your plan is to have them act as a reminder for everyone that’s working towards them. It will help you and your employees see just how important your duties and responsibilities are, and it will give everyone a sense of motivation to see that the goal is reached. You can also read 30-60-90 day plan templates. Let’s say that you’ve already figured out what your goals are. The next step that you’re going to have to take is to figure out who you’re going to be selling to. This is going to be very helpful as you want to know who you will be focusing your marketing and sales efforts towards. Doing this will ensure that whatever strategies you come up with will cater to the customers that you want to engage and conclude in successful transactions with. 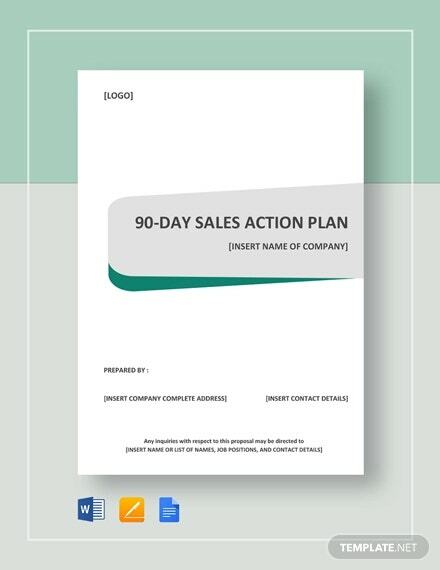 You may also see sample 30-60-90 day action plans. So what you’ll need to do first is realize what it is that you’re trying to sell and what it is that you want to reach within the span of the days you’ve set for your goals. Once you’ve been able to figure that out, you must then ask yourself this question: You may also see 30-day action plans. Who stands to benefit the most from what it is my business has to offer? Try to see who you think will be your ideal customer. Do you think that there’s a specific age group that you’re trying to focus on? Is the product or service meant for a specific type of buyer? You’ll need to answer questions that are similar to these so that you can figure out what kind of strategies you should be using. You may also see 30-60-90 day sample plans. When you’ve finally been able to understand what your goal is and who you have to be selling to, then the next step is to come up with the strategies that will help you meet your goal within the sample 90 days. This is the section where you will need to go into a lot of detail as you’ll want your employees to know exactly what it is that they have to do. It will also act as a reminder as to what kind of expectations that they’re going to have to meet if ever they want to reach the goal within the limited amount of time. Since we’re talking about sales, you need to answer this question: What can you do to make your customers buy from you? A good example is to get them interested in whatever it is that you have to offer. Knowing that you’ll need to think of the best ways to make sure that it happens. So what you can do is have your employees directly interact with customers to gain their feedback, or you can have them provide your customers with promotional material with every successful transaction they make. 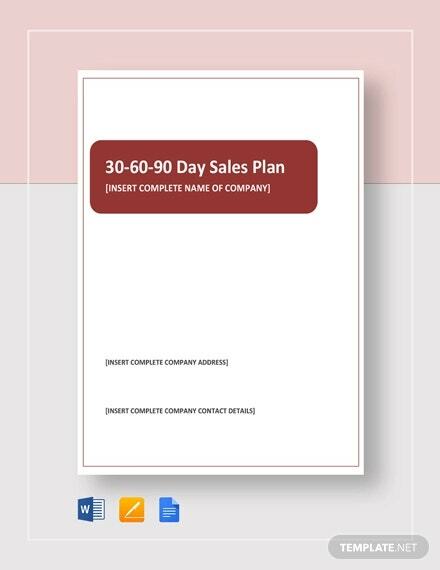 You may also see 30-60-90 day action plan templates. No matter what kind of actions that you decide to take, just make sure that you’re able to explain them thoroughly as you’re writing them down in the plan. You may also see 30-60-90 day plan samples. No matter what kind of strategy you decide to come up with, there’s always bound to be problems that could get in the way of you and your employees from achieving the sales goal. 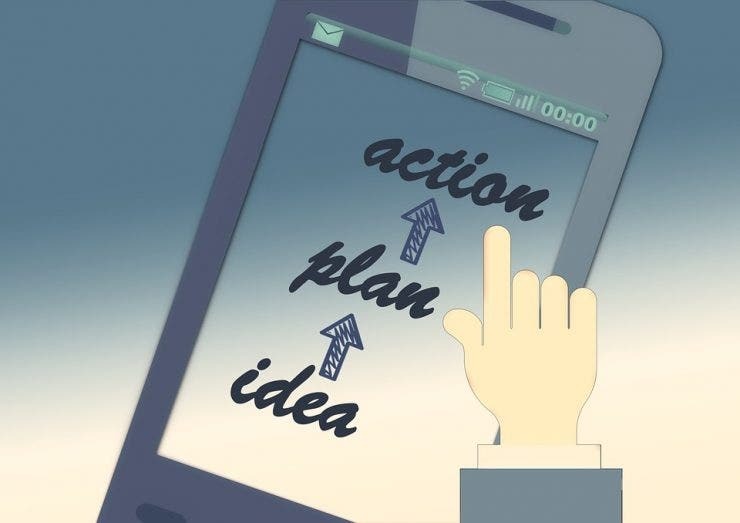 If you don’t want anything from stopping your business from reaching its goal, then you need to think about what these problems are so that you can come up with the best ways to deal with them. By providing an explanation on what they are and how they’re going to be dealing with, your employees will feel much more at ease and they can handle the problems themselves (assuming that they’re capable of doing so). 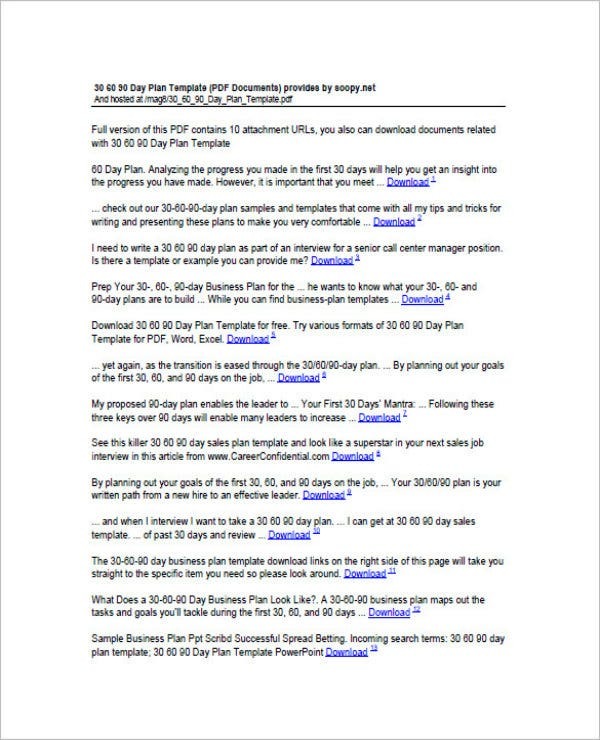 You may also see 100-day plan templates. So take a good look at all of the actions that have to take place. What are the different risks that your employees could encounter that could prevent them from working on their assigned tasks? Is there anything that could possibly harm them? Is there anything that could occur which may halt the whole process of reaching the goal entirely? Think about that and come up with a list of all the problems you’ve managed to find. You may also see free 30-60-90 day plans. Once you’re done doing that, then you have to come up with how you and you’re employees are going to resolve or prevent them from happening. You have to be detailed when it comes to explaining what has to be done to ensure that they become non-issues. Also, be sure that you and your employees have all the resources needed in order to deal with these problems in the most effective and cost-efficient way possible. 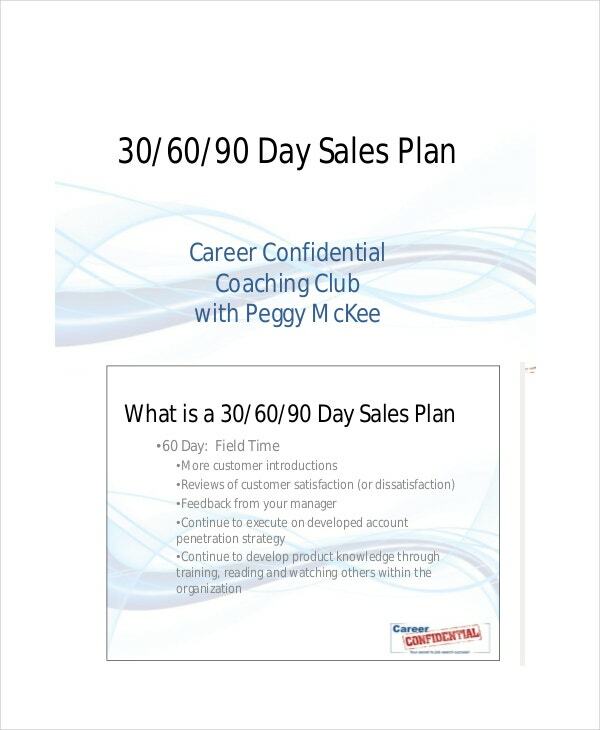 You can also read 30-60-90 sales plans. There’s no doubt that you’ll have competition which could prevent you from reaching your goals within the next 90 days. So what you’ll want to do is research on ways that will allow you to deal with them. And what the means is that you’re going to have to look into your competition to understand them better. The more you know your competition, the better you can come up with ways to gain the competitive edge against them. So what you’ll want to look into are both their strengths and their weaknesses. For the strengths, you want to see how they’re able to attract customers. Try to see if you can use their strengths against them, or if you should just come up with a better strategy to deal with them. You can also check out sales business plans. As for their weaknesses, you’ll want to learn all about that so that your business won’t suffer the same problems. Go through review sites to see complaints made by their customers and make sure that the same problem doesn’t exist in your own business. 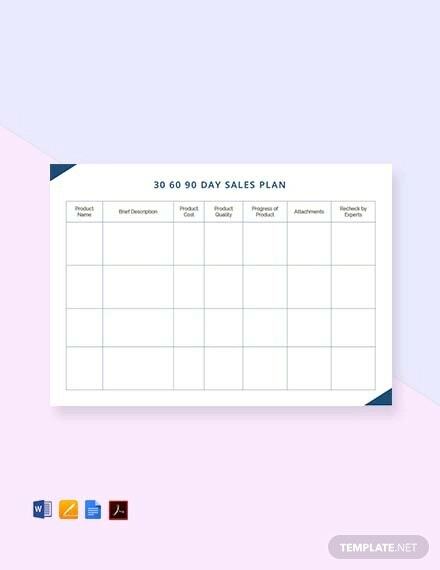 You can also read monthly sales plan templates. In the event that you would like to come up with other types of plans for your business, then all you have to do is go through our site. It has many different articles which should be able to provide you with the help you need. Just make sure that you are able to read through them thoroughly so that you can make effective use out of whatever information you gather from them.